Apartment 1 für 2-5 Pers. Apartment 2 für 2-4 Pers. Apartment 4 für 2-4 Pers. Apartment 5 für 2-5 Pers. Apartment 1 for 2-5 pers. Apartment 2 for 2-4 pers. Apartment 4 for 2-4 pers. Apartment 5 for 2-5 pers. 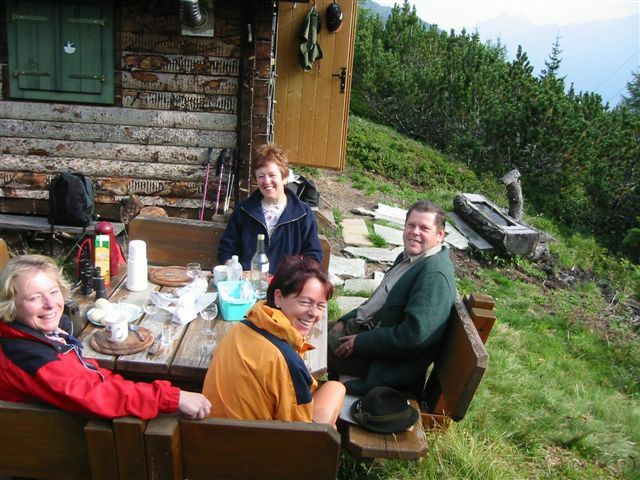 Your landlord and host is an avid hunter and has his own hunting grounds with a hunting lodge on the Radhausberg at an elevation of 1900 m in Hohe Tauern National Park. Join me for an enjoyable, interesting excursion to the hut. We will ride together in my car up the steep forest road, and for the last part we will hike along historical paths for ca. 20 min. Until the 19th century gold was mined on the Radhausberg. Architectural remains of gold mining can still be seen today. You can also learn a few things about the animals in the Alps and hunting. In the hut, you will be able to recharge your batteries with a traditional bacon snack and a glass of beer, and enjoy the wonderful landscapes including views of Gastein Valley. Book at least 7 nights! Your host will then be delighted to invite you out on this unique hut excursion. Click here to see our hunting lodge package.